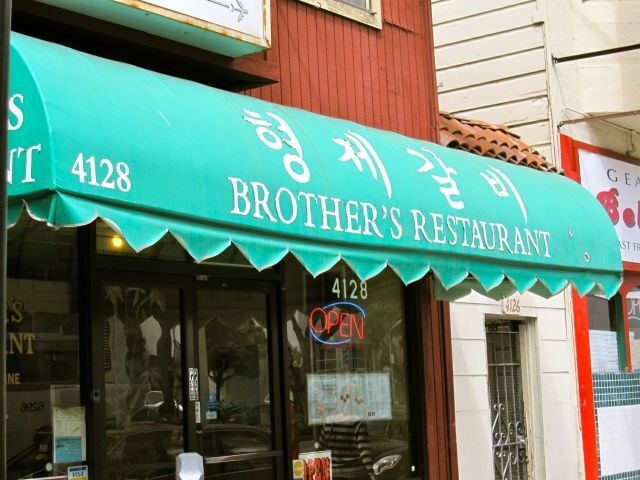 Brothers Restaurant, located San Francisco’s Inner Richmond neighborhood, is one of the few Korean restaurants in San Francisco that is Zagat-rated. It tied with Namu as Best Korean Restaurant in the 2010 Eat and Drink Reader’s Choice Awards by 7×7 magazine. Brothers is not a fancy restaurant, but it has a 20-plus year reputation (since 1987) of serving up authentic “old school” Korean food. It has generous operating hours from 11 am. to midnight Sunday through Friday. There is a second location a block east at 4014 Geary Blvd. It opened in 1993 but operates only Friday through Sunday 5 p.m. to midnight. Warning: Do not wear “dry clean only” clothes to this restaurant. You will walk out smelling like a barbecue grill, particularly one that uses real wood instead of briquettes. It’s the first Korean restaurant I’ve visited in the Bay Area that has grills embedded in some tables with vent hoods above. The staff brought out the glowing charcoal ready to cook right away. Based on the reviews at Yelp! and Zagat, many go to Brothers for the barbecue. My husband and I ordered kalbi (Korean beef ribs) and dakgui (grilled chicken) from their dinner menu and decided to grill them ourselves. The server brought us two different tongs, one for the raw meat and the other to cook it. The attention to sanitation scored points with me. The first food item brought to our table was a teapot full of hot barley tea. That scored even more points with me than the double tongs. Next, someone brought out the hot charcoal to get us instantly fired up for the main event. The “main event” came with 10 different kinds of banchan (side dishes), including cucumber, radish and cabbage kimchi as well as spicy anchovies, spicy odeng (fish cakes). We also had two different ssam options, either romaine lettuce or kim (sheets of seasoned dried seaweed; nori in Japanese) for wrapping the grilled meat. One of the highlights of the meal was the bowl of soon dubu jjigae (soft tofu stew). It was full of dubu, zucchini and chives. The broth may have had some dashi (Japanese fish broth) or seaweed in it because it had a slight ocean taste but it was really good. Kalbi ssam with a little bit of salty ssamjang peaking out. The only item we didn’t like much was the ssamjang (Korean wrapping sauce). It was heavily slanted on the doenjang (Korean miso) side rather than the gochujang (Korean pepper paste) side but it was a bit too salty so we decided to get our spicy and good salty fix by sprinkling our ssam (meat and lettuce rolls) with the spicy anchovies instead. Dak gui ssam is jjang! Prepare to pay about $30 per person, including tax and tip, for Brothers’ signature barbecue dishes. But this “old school” Korean barbecue is worth it. If barbecue is not your style or in your budget, Brothers has a wide variety of Korean soups and stews, including kalbi tang (Korean stewed ribs), kimchi jjigae (kimchi stew with beef), soon dubu jjigae (soft tofu soup) and kori kom tang (oxtail soup). The restaurant also has about a dozen lunch items offered from 11 a.m. to 2 p.m. Prices on that menu top out at about $15.